kwowledge placed on him. Although he quickly shut the lid on the box, the awesome knowledge he now possessed haunted him for the remainder of his life. We find in his speeches, conversations with friends, and in his writings, a total preoccupation with the problems of war and peace. Since planet earth is suddenly faced with the knowledge of the positive and negative potential effects coming from the use of the Tesla Magnifying Transmitter, it would be well to get a grasp of the future possibilities we face by reviewing Tesla's pioneering thoughts. The cycles are similar for plants and animals, the seasons, for the earth, the sun, and the stars. Someday, the sun's fuel would be expended, and earth would become a block of ice and, eventually, barren like the moon. But in this cycle there is always rebirth — and most importantly with the rise and cyclical fall ~ ever the onward movement to an unknown destiny. Being a scientist, Tesla knew that he could not deal with unknown past origins or with the unknown future, but he could deal with the present; and for him the present with characterized by the "onward movement." where the 1/2 term is dropped. Now analyzing the dynamics of this equation for energy, Tesla points out that when a mass is accelerated at a given velocity there are two main forces acting on it. One is the force which holds it back, the resistance to motion: the retardant force. The other is the force which moves it ahead: the advanced force. The balance of these two forces will determine how fast the mass will move, and this in turn determines its energy content. 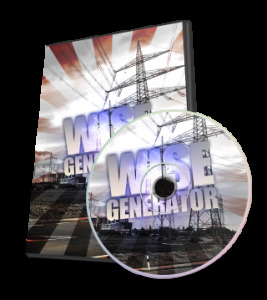 The energy content can be converted by various means to do work. Ultimately, Tesla said, humans are here on earth to work — to convert their inherent mass-energy into work energy which will further personal evolution, and the collective evolution of earth life. But he also pointed out that in addition to modulating the retardant forces and the advanced forces, one could increase the mass of humanity by increasing its numbers on the biosphere in order to increase its energy content. The human mass can show increased energy content, he said, by conserving itself hygienically by clean food, environment, and proper exercises; by "the promotion of marriage, by the conscientious attention to the child, and generally stated, by the observance of all the many precepts and laws of religion and hygiene . Tesla was most insistent on a high moral guidance of living processes. He expanded on this theme in many of his writings. But he noted that the key obstacle to increasing the human mass was the limitation of the food supply. Here Tesla made another practical and brilliant contribution. He pointed out the well-known fact that the soil needed soluble nitrogen to have a high yield of food. It was Tesla who discovered that high frequency, high voltage electrical discharges were the cheapest method of getting the nitrogen from the air to combine with oxygen and hydrogen to produce nitrogen oxides (NOX) and ammonia (NH3) -the starting point of all soil fertilizers. Today hundreds of millions of tons of such fertilizers are used on earth every year to increase agricultural production. However, after 75 years of such nitrogen fertilizer use, man has begun to learn that it too presents a hazard to existence. The nitrogen oxides evaporate from the soil and rises to the upper layers of the stratosphere where they have a strange chemical action. This layer of the stratosphere contains a thin layer of ozone, sufficient to act as a shield against deadly ultraviolet rays reaching the surface of the earth. If these deadly rays reached earth, all life would be extinguished eventually beginning with a dramatic increase in cancer in all living things. It is now known that the nitrogen oxides have a peculiar catalytic effect in destroying ozone — each N02 molecule can destroy about 10,000 ozone molecules! There is strong evidence that the ozone layer is now slowly being depleted and thinned. This is due to the catalytic breakdown of ozone by many agents other than the nitrogen oxides. But the TMT, wisely used, can selectively repair damage to the ozone layer, and regulate the amount of ozone in the shield. Tesla was aware of this potential use of the TMT. The Soviets have created this beneficial by-product of their global warfarfe system, but have failed to tell the world about it. This will be explained later. Tesla went on to analyze the retardant forces acting on the onward movement of man. He compared these to frictional effects which can be cured by the proper lubrication. The greatest of these retardant forces, says Tesla, is ignorance. And the greatest manifestation of ignorance, he points out, in "civilization" is organized warfare. The best lubricant for ignorance is education which becomes an "eraser" of ignorance. But the problems of war, Tesla realizes, are ultra-complex. First, he recognizes that an orderly society needs to have the governing influences of law, and a means to enforce laws, i.e., police. He analyzes brilliantly how war feeds on ignorance, its appeal to bravery and sacrifice, and the lure of medals and other rewards and honors that come from battle. In his incisive way he proposes a solution unthought of in 1900: eliminate men as combatants of war! In the process of education, he says, we should escalate war to the level of a sophisticated game in which man has no role except to produce teleautomatons, i.e., robots. Since he was the one who created this science he could also brilliantly advise as to how to use it. But these robots would have all the intelligence and skill of thinking man. They would exist in the form of "thinking" aircraft and rocket spacecraft — maneuvering with respect to each other's intentions without interference by man. But they would only outwit, or destroy each other—not man or the planet earth, When this was achieved technically, man would be cheated out of getting a personal thril out of war, and this barbarous practice would be replaced by true, creative peaceful processes. Today as some 4,000 satellites clutter space, and we read press reports of the U.S. and the Soviet Union having developed satellites that can carry on warlike acts between themselves, Tesla's vision approaches reality. What Tesla believed in strongly, up to 1930, was that war could be abolished by pushing the tools of war to such sophistication that they could operate independently of man. To this end he developed from the TMT a machine that could put up an invisible curtain of defense around any country, which was not penetrable by aircraft or missiles, However, he later modified his thinking when he realized that all automation of war weaponry war in the direction of "overkill." That Tesla himself did not actively develop the many teleautomatons he designed torpedoes, submarines, aircraft, etc., is proven by a curious set of historical events. One of the private benefactors of Tesla beginning in the 1890s was John Hays Hammond, the great mining engineer who became the U.S. Ambassador to the Court of St. James in England. Hammond lived in Gloucester, Massachusetts on the seacoast facing the reef of Norman's Woe. His great friend and neighbor was Colonel William House, who in turn was the personal political adviser of President Woodrow Wilson, the U.S. President from 19141918, and 1918-1922. John Hays Hammond had a son, John Hays Hammond, Jr., or, as my friend Jack Hammond. When Jack was a student at the Sheffield Scientific School of Yale University he met Tesla through his father, Jack told me that this meeting changed his life - he wanted to follow in Tesla's footsteps for a career. During many conversations between Col. House, John Hammond, Tesla, and Jack before World War I started, they discussed the inevitable coming of this war, and how unprepared America was. When Wilson was elected President in 1914, Col. House was in a key position to inform the President of Tesla's ideas with respect to peace and war. President Wilson wanted peace, and kept America out of the war as long as possible. But he was also responsible for making sure that America was prepared for war. Col. House persuaded President Wilson to start a secret program of putting Tesla's teleautomatics into practical use by the U.S. Navy. Tesla declined to participate in this program to build war machines. But he allowed young Jack, who was only 25 years old to go ahead with his ideas . Jack entered into contractual arrangements with the U.S. Navy for several millions of dollars, and perfected and applied the Tesla teleautomatic patents to battleships, torpedoes, gun-fire control, submarines and aircraft. Jack received several undred U.S. Patents as result of his work. When the U.S. entered World War I in 1917, it was armed with the best of Tesla's ideas for automation of warfare. When Tesla saw World War II coming as early as 1935, he secretly offered his "Wall of Force" defense system to Great Britain, Canada, and the United States. His aim was not to get rich, because he was now thoroughly adjusted to his monastic life, but only to prevent war, and secondly to save the best values in Western civilization against the satanic doctrine of Adolf Hitler. But the military advisers of these great powers from 1935 to 1939 were blind to Tesla's advanced technology. As we now sadly know, it was not until 1976 that the Soviets were able to recapture the advanced thinking and technology of Tesla. And now, as in 1914, and 1938, the world teeters on the brink of another world conflagration, but this time armed with nuclear weapons, military computers, and mind-enslaving global magnetic warfare methods. But in 1900 Tesla was still optimistically trying to chart the long course man had to work through to find peace. In addition to working out methods to increase human mass-energy as outlined, and his vast contributions to lubricating the retardant forces with teleautomatic science and technology, he contemplated methods of increasing the advancing forces in man's energy equation. His analysis is superb. He points out that all of the energy on earth available to man coal, oil, wood, waterfalls, tides, wind, solar radiation, etc., all come from the sun. The best way to increase the energy contribution of the advancing forces on man is to capture more of the motive power of the sun, thereby amplifying man's natural energy endowment. This amplification would increase his work output, acting on himself, the environment, and in evolution. The onward movement of man would be accelerated. He points out in no uncertain terms how barbarous it is of man to burn up millions of year's inheritance of wood, coal and oil in a few generations. Man must find renewable, non-depletable sources of energy. He then produced a long list of inventions to bring about this result. He invented an advanced type of steam engine to more efficiently utilize coal; he invented and perfected the best high pressure steam turbines ever known; he devised apparatus to capture the vast geothermal energy of the earth. He invented solar energy devices that converted sunlight by day into electricity, and the sun's radio waves by night into electricity. He invented devices to convert heat directly into electricity — thermoelectric machines. He devised methods to convert magnetism, or gravity directly into motive power. And all the electrical output of these inventions was to be transported wherever needed on the planet by a grid of Tesla's Magnifying Transmitter Towers. But he reserved his highest skill and greatest dedication to finding ways to extract energy from what he called the ambient medium - literally the thin air and/or vacuum around us. Today we would call this goal the extraction of energy from zero-point vacuum fluctuations. This process also contemplates penetrating the wall of light, the velocity-of-light barrier, to extract energy from the domain of tachyons, particles exceeding the speed of light, at supraluminal velocities. Theoretically, this energy transfer across the wall of light occurs through mini-black holes, and mini-white holes, a theory not yet proven, but under active discussion by scientists today. Tesla outlined the five elements that must be mastered to extract energy from the ambient medium. But his approach did not contemplate extracting energy from mini-holes (something of the order of 10-39 centimeters diameter), but from the vacuum regions between the planets. He planned by modulating the electrostatic forces around the earth, and thereby perturbing the sun, to draw energy from the sun to earth. His five elements were outlined by him. First, he needed a mechanical modulator that would tap the earth to bring out full mechanical resonance. This would produce a sonic wave bouncing from pole to anti-pole every 108 minutes. He solved this problem by means of a unique steam engine which he exhibited as early as 1893 at the Chicago World's Fair. Second, he needed to develop an air compressor that would liquify the air in sufficient amounts to run his huge TMT secondary coil at superconducting temperatures. He worked for a long time at this problem, but it was solved by Dr. Carl Linde working independently, and Tesla was the first to give him recognition for priority. represents the atmosphere. 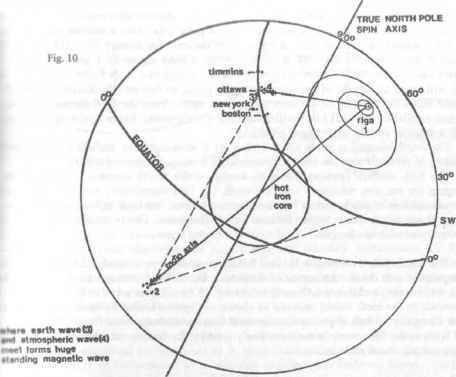 In Figure 6, the earth, S, is energized by the TMT and light (radio waves) resonating between the earth, S, and the ionosphere, L, in different patterns as shown also in Figures 7 and 8. Figure 8 shows that a beam of light can be formed in this model. Figure 10 shows more clearly how such a beam is formed which we have been calling a "standing wave". In Figure 10, we have two velocities of electromagnetic waves interacting: velocity AC-1 emanates from Riga (1) as ionosphere electromagnetic waves moving at the velocity of light, c, and goes to Point (4). Velocity AC-2 goes from Riga (1) directly into the earth through the hot iron core where it picks up energy and a velocity greater than c, the tachyonic level, to reach the antipode at (2). At (2), much of the energy dissipates into space, and some of it is reflected by scattering around the iron core in the cone shape to (3) and thus the standing wave, SW, is formed by velocity-phase interference patterns. These phase relations work very much like the rotating magnetic field phasing of Figure 2 to produce a magnetic standing wave. This magnetic standing wave can be moved, steered or made stationary (at any rate desired) by adding another wave to the system, emanating from Gomel. When the wave from Riga, and the one from Gomel are properly phase-locked, the wave, SW, can slowly sweep around its great circle route, or can be made to stand still over cities like Timmins, Ottawa, New York, Peking, etc. The Soviets have used the region between Timmins, Ontario and Ottawa, Ontario, very heavily as a human experimental territory because they had a large spy network in this area ready to report the local effects back to Moscow by secure diplomatic pouch. This spy ring was broken up by the Royal Canadian Mounted Police (RCMP) in February, 1978, and 26 KGB agents operating out of the Russian Embassy in Ottawa were expelled from the country. As we have already amply documented from Tesla's models, his Colorado springs experiments, and the Soviet experiments, tins thud element of ionospheric conduction has been mastered. The Soviets perfected Tesla's art by having a large satellite in polar orbit with a nuclear power plant of 100KW aboard to help control the standing wave pattern. On January 24, 1978, this nuclear powered Soviet satellite crashed in the Great Slave Lake region of Canada. It is not known yet whether the U.S. government shot it down with one of its Killer Satellites. Only time will reveal the depths of the secret struggle going on between the Soviet Union and the United States for mastery of the skies over planet earth. Thus the third element involves an electric oscillator (the TMT) that will resonate the electrostatic forces operating between the earth conductor and the ionospheric conductor. The fourth element requires all of Tesla's art of teleautomatics, including computers and satellites to precisely tune the earth to resonance to produce the desired effects. The fifth element requires the earth tuning of the fourth element to be extended to bringing the sun into resonance with the earth. This immediately sets up interplanetary communications of much energy between the two bodies. 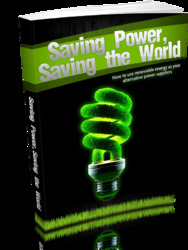 The trick is to control the flow of energy from earth to sun in perfect balance for life functions. This is not easy, and too little is known about what can happen. The ideal full wavelength for an 8 Hz wave is approximately 23,500 miles long (comparable with the circumference of the earth - Ed. note). A one-quarter wavelength for 8 Hz is 5875 miles, and this is 1.48 earth radii long. A one-quarter wave length signal for 8 Hz generated on the earth would resonate as shown in Figure 11. The Table and Figure 11 also show that the inner belt of protons can be used to resonate frequencies from 6.66 Hz to 10.80 Hz. This is the filter mechanism most likely used by the Soviets, in addition to the satellite orbiting at this same altitude.